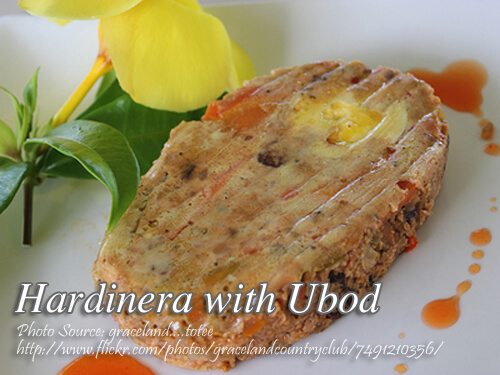 This Hardinara with ubod recipe is a modified version of the popular hardinera recipe from Quezon province. This is also a recipe for those who love to eat ubod or heart of palm. Although this seems not an everyday dish because of the cost of the ingredients, this recipe use simple and easy to find ingredients that doesn’t hurt your budget. To cook hardinera with ubod; Heat oil and saute garlic and onion until soft. Add ubod, sliced pork, ground pork and liver. Transfer mixture into a bowl. Season with salt, pepper and soy sauce then add in cornstarch and lightly beaten eggs. Mix thoroughly until the mixture becomes uniform. Lined bottom of 4 pcs aluminum flan pan (those that used in leche flan) with wax paper. Arrange strips of bacon, hotdog, bell pepper and egg slices. Pour and fill each flan pan with the meat mixture leaving at least half an inch from the rim. Steam for 30 to 45 minutes or until cooked. To see the complete recipe, continue reading. Heat oil and saute garlic and onion until soft. Add ubod, sliced pork, ground pork and liver. Transfer mixture into a bowl. Season with salt, pepper and soy sauce then add in cornstarch and lightly beaten eggs. Mix thoroughly until the mixture becomes uniform. Lined bottom of 4 pcs aluminum flan pan (those that used in leche flan) with wax paper. Arrange strips of bacon, hotdog, bell pepper and egg slices. Pour and fill each flan pan with the meat mixture leaving at least half an inch from the rim. Steam for 30 to 45 minutes or until cooked. To check if the hardinera is already cooked, prick a toothpick and if it comes out clean, it is already cooked. Unmold into a platted lined with cabbages or any desired leafy vegetables. Slice and serve hot.